Have a question on Chairman W? Chairman W is available in 5 different colors - Sapphire Black, Grand White, Classic Black, Diamond Silver and Titanium Gray. South Korean auto maker Ssangyong is exemplary of creating refined products. Ssangyong Chairman is a full-size luxury sedan, that sets a new benchmark for the brand and considered to be influenced by the old model of Mercedes-Benz S-Class. The “W” in its name signifies World Class, the New Chairman proposes a prestige befitting a CEO. In other export markets, this amazing car is also available in its long wheelbase model that is favored by some limousine engineers in South Korea. 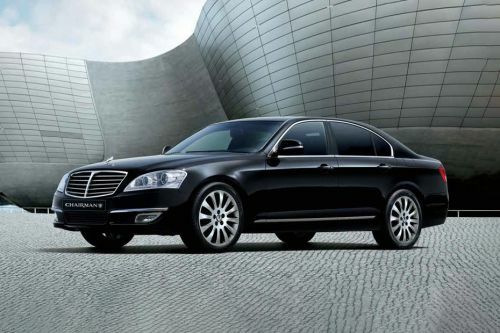 According to others opinion, Chairman could never competes with European Brand, but the fact is that, this South Korean sedan is exceptionally good. With its sleek and captivating interior design, the new Chairman treats the driver as another VIP, while exhibiting the impression that seeks from the start. Its curvaceous board, profusion of smooth leather, foldable rear seats and innovative interior inserts increases your driving pleasure effectively. Plenty of wooden trims complements its overall design, however, rear seat console sets a new standard of luxury inside. To increase your excitement, this amazing sedan is embedded with Harman-Kardon 7.1-channel surround sound system with 17 speakers, along with 8-inch TFT LCD display and 6-disc DVD changer brings you to a live performance in Opera house. Leather covered steering wheel mounted with audio controls adds the comfort factor for the driver, while providing fine grip. The driver’s seat is employed with electronically activated head restraint, proposing an ideal position proposes a relaxing drive to the driver. Ssangyong Chairman exhibits a blend of straight and curved lines while inspiring admiration. With its magnificent and clean design, every ride gives a new experience for the passengers. Looking at this luxury appeal, the Chairman receives large radiator grille well-finished with chrome detailing, along with stylish pair of headlamps resembling the latest generation of Mercedes-Benz S-Class. Its wide and attractive hood with Dragon insignia at the centre makes it easily recognizable from every corner. All-new variants of this luxury sedan comes anchored with sporty 17-inch alloy wheels, comprising the tire size 235/55 R17. The standard dimensions of Chairman can be measured as 5135mm x 1895mm x 1495mm. (L x W x H) The wheelbase of this sedan ranges from 2970 mm to 3270 mm. New Chairman manufactured by Ssangyong is made available in three variants named as CW600, CW700 and V8 5000. All of these variants are further distinguished in their sub-variants which totals to 6 different variants in the range. Chairman’s trim levels comes with four types of petrol engines including G28D, G32D, G36D and G50D. The base engine variant such as G28D excels the maximum power of 200 PS at 6000 rpm, along with the high torque of 265 Nm in 4600 rpm. The 5000cc V8 engine on G50D designed by Mercedes-Benz churns about 306 PS of power at 5600 rpm, with the peak torque 441 Nm in 4400 rpm. Further, these engines are coupled with 7-speed automatic transmission that brings a smooth ride for the driver. Trims with powerful 5.0 litre V8 engine takes 8.8 seconds to breach the mark of 0 to 100 kmph, while giving the top speed as 245 kmph. Also, it delivers the fair mileage of 7.8 kmpl. South Korean manufacturer has not only worked on the designing part, but also made its best effort in providing its occupants the maximum peace of mind during their long journeys. Its smart driver’s and front seat airbags activates in two stages, based on the position of the occupants, however, enhancing safety at the event of an accident. Active cruise control appointed in the car, detects what the driver misses and makes you reach safely to your destination. Also, this smart car is employed with electronic stability control integrated with number of advanced system such as EBD, ABS, BAS, hill start assist and anti-spin regulator, let you feel confident while driving. Further, its active braking system comprises all-wheel disc brakes, accompanied by multi-link suspension for both front and rear axle. Ssangyong Chairman, despite being one of the most elite drives available on roads today is significantly reasonable than its competitors, loaded with similar type of equipment and efficient engines. But the prominence of Ssangyong brand in auto markets might make you think twice before buying this car. What is the price of Ssangyong Chairman W? On road prices of Ssangyong Chairman W in starts from AED173,250 for base variant 3.2L, while the top spec variant 5.0L costs at AED231,000 . What are the colors options available in Ssangyong Chairman W?